Conservation behavior assists the investigation of species endangerment associated with managing animals impacted by anthropogenic activities. It employs a theoretical framework that examines the mechanisms, development, function, and phylogeny of behavior variation in order to develop practical tools for preventing biodiversity loss and extinction. Developed from a symposium held at the International Congress on Conservation Biology in 2011, this is the first book to offer an in-depth, logical framework that identifies three vital areas for understanding conservation behavior: anthropogenic threats to wildlife, conservation and management protocols, and indicators of anthropogenic threats. 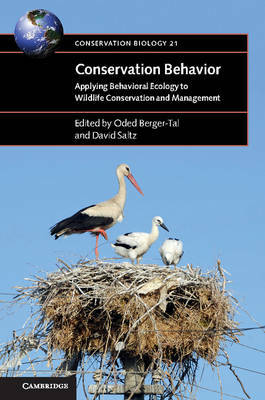 Bridging the gap between behavioral ecology and conservation biology, this volume ascertains key links between the fields, explores the theoretical foundations of these linkages, and connects them to practical wildlife management tools and concise applicable advice. Adopting a clear and structured approach throughout, this book is a vital resource for graduate students, academic researchers, and wildlife managers.